Valindor's House is a house that is home to Valindor. 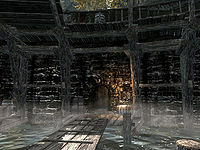 It is located on the lower levels of Riften by the canal that flows through the middle of the city, it is next door to Marise Aravel's House, below the Temple of Mara. This dwelling is a single room with a partial wall dividing the space into two areas. You are in the main living area upon entering which consists of a fireplace against the east wall opposite with two chairs pulled up in front and a cooking pot on the hearth. 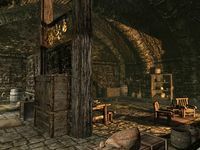 Along the north wall is a set of shelves holding a bottle of alto wine, a bottle of Nord mead, a sweet roll, several potatoes, an apple pie and several pieces of cheese. To the left of this is a wall shelf with a bottle of Nord mead on top. Against the west wall is a dresser with a copy of Of Crossed Dagger on top. Against the partial south wall is a dining table and bench along with several barrels and sacks of foodstuffs. On the table is a baked potato, a portion of grilled leeks, a loaf of bread, an eidar cheese wheel, a bottle of alto wine and a bottle of Nord mead. Hanging above the partial wall are two garlic braids, two bunches of elves ear, and two bunches of frost mirriam. There is a small table between the chairs in front of the fire holding a bottle of wine. Beyond the partial wall is the sleeping area consisting of a single owned bed coming out from the north wall, with a barrel and end table either side of it. A copy of Horker Attacks is on the end table. To the right of this is a wardrobe of clothes and opposite this against the south wall is an unlocked wooden chest containing minor loot. There is a Loot shadowmark on the left doorstep. There is a chest with minor loot inside. Once you have joined the Thieves Guild, a barrel that is carved with the Cache shadowmark appears opposite the entrance, on the walkway that travels along side the canal. Esta página foi modificada pela última vez à(s) 00h36min de 8 de novembro de 2014.